Writing for the Web – same as it ever was? I’m currently writing new copy for the Boost website, which will be relaunching soonish with an updated look and a lot of new information. This has got me thinking about what’s changed about writing for the web in the 5 years that I’ve been doing this, and what’s stayed the same. writing tightly, avoiding padding and the passive voice. I’ve always had a bit of a bee-in-the-bonnet about link text. Thankfully, the days of ‘Click here’ seem to have passed, and people are writing link text that indicates where you’re going to be taken when you click. Generally, I prefer to be told/shown (and tell/show people) whether the link they’re about to click will keep them within the site they’re currently on, send them off to another site, or (pet peeve) trigger a PDF to start downloading. Much as I love the Guardian‘s website, I’m often caught out by the behaviour of their links, which sometimes take you to another article, sometimes take you to an external site, and sometimes trigger a canned search. 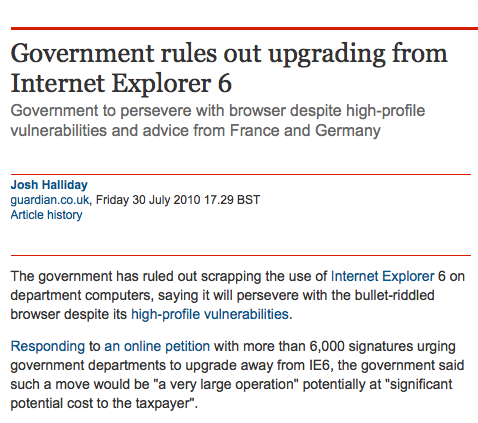 In the example below, ‘Internet Explorer’ triggers a search, ‘high-profile vulnerabilities’ is a link to another Guardian article, and ‘Responding’ and ‘an online petition’ go to two different external sites. You can help people with the way you write your link text – see the WC3 guidelines on link text. Or perhaps you’ll read Nicholas Carr’s latest book The Shallows, where he argues that “the Internet encourages the rapid, distracted sampling of small bits of information from many sources”, and be inspired to corral the hyperlinks that are normally sprinkled through your text at the end of the page, as Laura Miller did on Salon. Then again. I often feel like a hypocrite when laying down the law for link text in a blog post. Blog posts, obviously, thrive on links, and often when putting a post together you use your link text in a slightly crafty way: linking to something incongruous to make a little joke, piling up a sentence full of evidence for your argument by pointing to different pages with each word. 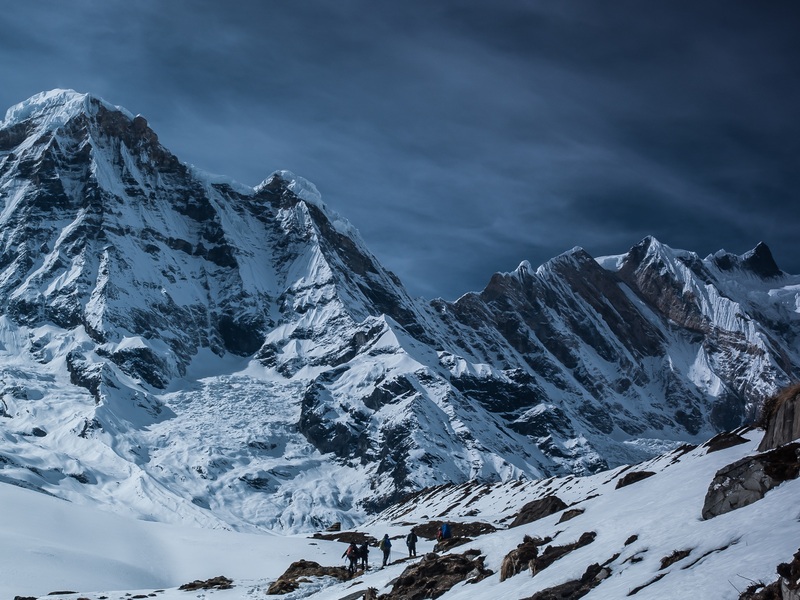 Blog posts are – along with other forms of conversational writing driven by social media tools – part of the changes to classical/corporate web writing that I’ll come to at the end of this article. Another rule that’s stood the test of time: avoid jargon and use of acronyms (the TLA is a recurring cause of WTF on the Internet). Don’t use a fancy word if a simple one will do. 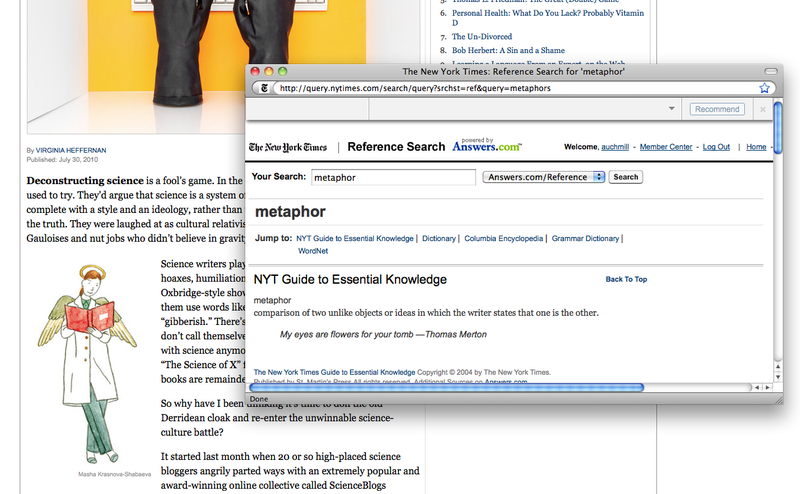 That said, I’m a fan of the New York Times‘ look-up feature: if you double click on a word, a small question mark appears, and then when you click on the question mark, a definition from the American Heritage Dictionary appears in a pop-up box. Sure, it’s a bit of an insider’s trick, but it’s simple and unobtrusive. Plus, they report back on the words that stump people the most. I think the moral of this blog post is that good practice has generally stayed the same when you’re writing for a website, particularly a corporate or government site. But with the introduction of social media, things have changed. Yes, it’s true: some communication professionals are still unfamiliar with the working principles of content management systems, search engines, and accessibility. Some profess ignorance or horror when you mention Twitter, Facebook, or even blogging. They still haven’t noticed the C in ICT, or the technical in technical communicators. They barely know what the phrase social media refers to. This is understandable if retirement is close. But tragically, some of these communication nuns are young, really young—in their twenties. Can you believe it? First came blogging. For the first time, we were told that a personal voice – one that came from an actual identifiable individual – was important. More informal, sometimes opinionated, sometimes playful; the blogs you return to over and over again are the ones where you are intrigued either by the quality of the content or the quality of the writing. What room does this leave for actual writing? Stylistic flourishes do not appear to be the book’s main concern. Instead, most advice is directed at generating more page views. All the guidelines have a hypothetical reader in mind—a reader who is constantly in a hurry, would never “jump hurdles” to find a piece of information, and must be roped in at all costs. Writing for blogs and Twitter let me play again. Sure, the basics still apply. Spelling mistakes, grammatical errors, and unnecessary verbiage won’t do you any favours. But you can’t learn this kind of writing from style guides, just like you can’t grow a personality from self-help books. The people who write for you on the web – scratch that, the people who speak for you on the web – are now found in your web team, your call centre, your development teams. What interests me is when the two types of writing get mashed together. When you stream your tweets to your homepage, does one kind of writing make the other seem incongruous? Is your corporate site as fun to read as your Facebook page? Should it be? What do you think?